Two relatives of Wayne Hurren, who was found dead in his cell at Wormwood Scrubs, have staged a protest claiming his mental health needs were neglected. Hurren, one of Britain's most notorious gangsters, is understood to have killed himself in the west London jail on Saturday. His son and brother-in-law threw pig's blood at the prison walls and a van and glued their hands to the gate. The Prison Service said the death was being investigated. Hurren's son Paul Hurren and brother-in-law Paul Tiernan glued their hands to the gate to "stop the prison from functioning and cause disruption" and threw blood "because they feel the prison has blood on its hands", a relative said. The Metropolitan Police said the protesters were "safely removed from the gate" and arrested on suspicion of criminal damage. Mr Tiernan's daughter Harriet Tiernan posted the footage on social media. She said Hurren had asked for mental health support but was "ignored" by prison staff. "It's disgusting. Something needs to happen," she told BBC News. "They knew Wayne had long-term mental health issues. If someone had gone to speak to him and given him the help he asked for then maybe he would be here today. "He shouldn't have been in a prison, he should have been in a mental health hospital." The Met said it was called to Wormwood Scrubs at about 07:20 GMT after two men "glued themselves to the perimeter gate". They have been taken to a west London police station while inquiries continue. Hurren, 57, was serving a sentence for firearms offences after completing an earlier jail term for wounding three police officers and a string of armed robberies. In 1996, he was charged with three murders, one of which it was alleged had been organised on a prison telephone. He was later cleared of those charges. 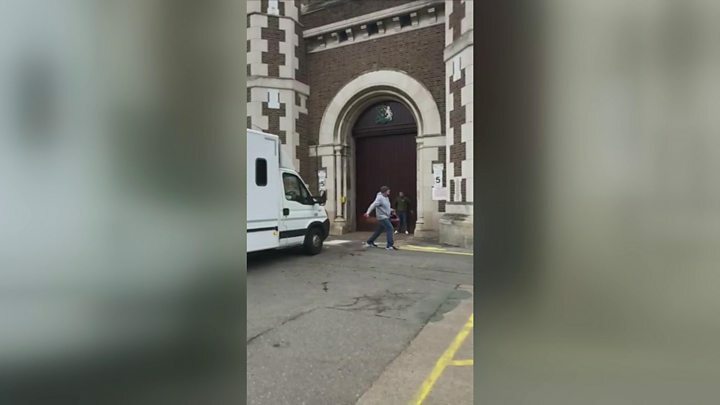 A Prison Service spokesman said: "HMP Wormwood Scrubs prisoner Wayne Hurren died in prison on 16 March 2019.